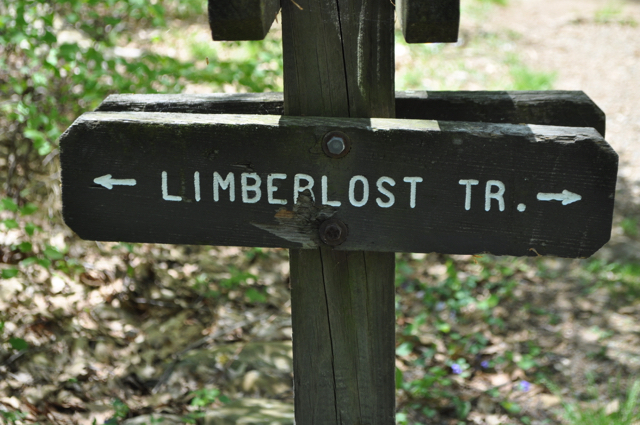 Limberlost Trail is the one accessible trail in Shenandoah National Park. 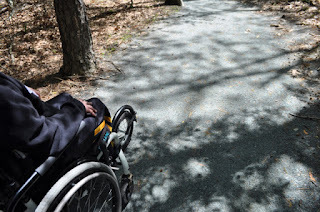 It technically is not entirely accessible, but mainly because it is too steep to meet the current ADA standards. 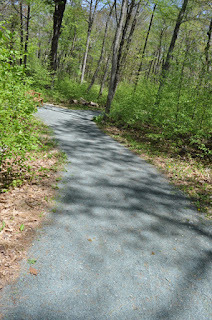 However, we've certainly been on less accessible trails. Even the trail we did a few days before this at the Natural Bridge was tougher than this one. There is a nicely detailed explanation of the trail on the sign by the trailhead. 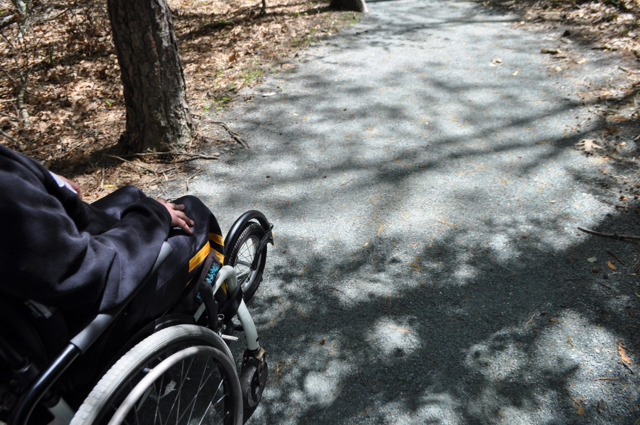 It explains how part of the trail is up to current ADA standards. Thus, if you start that way, you can do a there and back instead of the whole loop if the rest of the trail seems too difficult. However, it actually is kind of easier to do it the other way as a loop because this makes the most steep parts downhill. The path is mostly crushed greenstone. 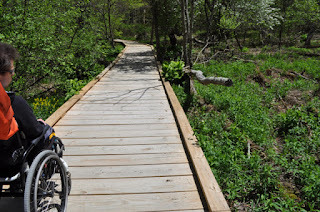 Normally probably wouldn't use the freewheel for this type of trail, but with the caster being so messed up at that time even the it was helpful for even the smoothest of surfaces. 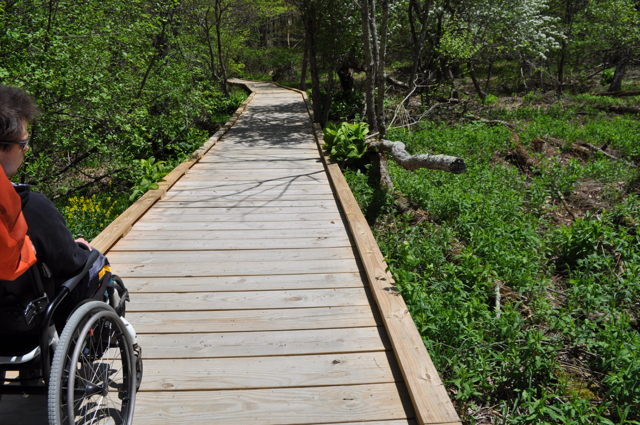 There is also some boardwalk as part of the trail. 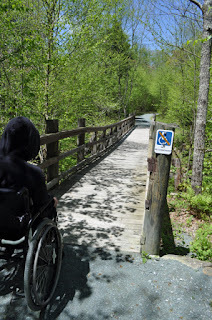 The bridge is where it is no longer recommended for wheelchairs. It's really not that steep, though, with the main thing being that going this way it ends up being 9 to 12% uphill near the end. Overall it's a decent trail in that it is very accessible. 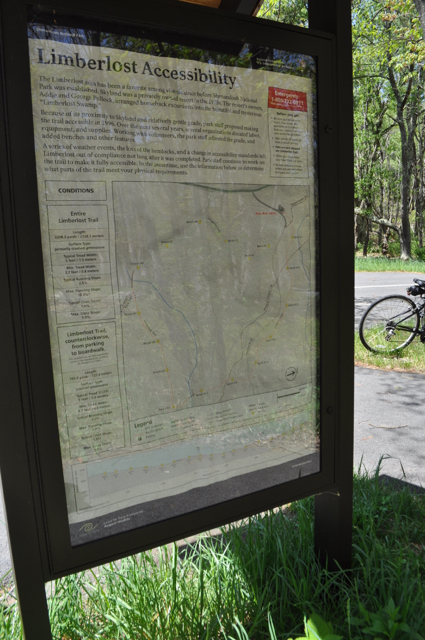 However, Mik thought it was not any more interesting than what he could see on the rest of Skyline Drive. Having done other trails the previous day with Dad and actually getting some better views and seeing waterfalls, I'd have to agree that this particular trail is kind of boring. Apparently, it has a lot of mountain laurel, though, so it might be more interesting when they're in bloom.